There is no shortage of NBA action on Sunday, with eight games populating the league's schedule. The Clippers started off the day with a matinee victory over the Knicks at MSG. Then, later in the afternoon, the Bucks cruised past the Cavs, and the Pacers picked up a very impressive 36-point win over the Nuggets. Jeremy Lamb then provided one of the plays of the season with a halfcourt buzzer beater to lift the Hornets to a stunning win over the Raptors, while the Rockets easily dispatched the lowly Pelicans. In one of the day's marquee matchups, LaMarcus Aldridge and the Spurs crushed the struggling Celtics. 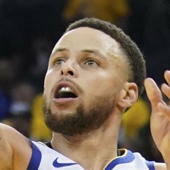 To close out the night, the defending champion Golden State Warriors took down the Pistons to take a half-game lead over the Nuggets for the top spot in the Western Conference. In addition, the Lakers were able to halt their five-game losing streak and top the Kings at home. Stephen Curry and Klay Thompson have always been the straw that stirs the drink for the Warriors. The dynamic duo combined to score 50 points in the team's win over the Pistons. Even at age 34, LeBron James can still make it look so easy. James displayed this against the Kings when he dropped off a beautiful no-look pass to JaVale McGee, who deposited an easy slam dunk. Blake Griffin is often a player that posterizes his opponent. However, Griffin was on the receiving end on Sunday when Shaun Livingston slammed one in Griffin's face. It certainly wasn't how James Borrego envisioned the play working out when he initially made the call but it's hard to argue with the results as Jeremy Lamb kept the Hornets' playoff hopes alive in the most unlikely of ways by hitting a game-winner from the backcourt. The Spurs handed the Celtics their fourth straight loss on Sunday evening, and did so thanks to a monster performance from LaMarcus Aldridge. He may not be the most exciting player, but he's both effective and efficient, and that was especially true in this game. Aldridge put up 48 points, 13 rebounds and six assists on 20-of-31 from the field. Giannis Antetokounmpo proved once again why he is one of the leading candidates to win the NBA MVP award this season with his performance on Sunday against Milwaukee's Central Division rival as he recorded a monster double-double in the Bucks' 127-105 win. Bojan Bogdanovic was nearly perfect in the first half against the Nuggets. He went 10-of-11 from the floor for 26 points to help the Pacers get off to a good start. In the end, he finished with a game-high 35 points on an incredibly efficient 13-of-16 shooting. Another day, another awesome dunk from Giannis Antetokounmpo. Check this one out in super slow-motion as the Greek Freak spun past Larry Nance and threw it down. Lou Williams has been fantastic for the Clippers all year long and he continued that trend on Sunday afternoon by helping lead his team to a victory at Madison Square Garden by dropping 29 points, including 15 points coming in the fourth quarter. DeAndre Jordan may be in New York now, but he's still throwing down alley-oops like he's in Lob City. Check out this big one-hand oop he hammered home against his old team. The Boston Celtics will be shorthanded in the frontcourt when they square off against the San Antonio Spurs later this evening as the team has announced that veteran center Al Horford will be sidelined with what the team is describing as left knee soreness.